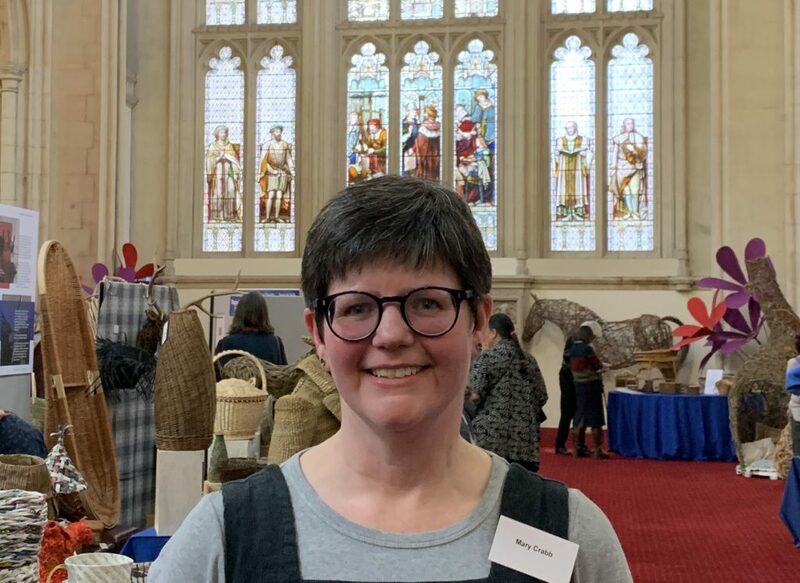 This week I am in the company of the Sussex based artisan artist, Mary Crabb, as she prepares to run a series of workshops in the art of Basketry at the Oxmarket Gallery, Chichester. These one and two day creative workshops run from Tuesday 26th to Sunday 31st March. Mary’s workshops are in demand across the UK. I ask her what draws people to them. She answers “People come for lots of different reasons, not necessarily just to learn a new skill or develop their practice. Those who join these workshops are engaging in open minded creative thinking which can be quite courageous.” There is a sense in which Mary is building communities through her work bringing people together and providing them with a shared narrative, a common story. As a practical, practising basket maker Mary was honoured by The Worshipful Company of Basketmakers when she was elected as a Yeoman Member. Yeoman must spend the majority of their time basket making or teaching and are required to demonstrate a high standard of workmanship and skill in the Craft. Mary’s enthusiasm is infectious. These exciting workshops will be held at the Oxmarket Gallery, St Andrews Court, off East Street, Chichester, West Sussex, PO19 1YH, from Tuesday 26th to Sunday 31st March 2019.